The new Kverneland 6350 full roller fixed chamber baler is designed for intensive professional use through long working days where high efficiency is required. The Kverneland 6350 is developed to perform well in heavy silage conditions. A new bale chamber design with 17 ribbed rollers ensures consistently high density bale formation in all conditions. 2.2m pick-up with small diameter pick-up reel with 5 rows of tines. PowerFeed rotor intake, 14 or 25 knives cutting device. Parallelogram Drop Floor for easy unblocking. Fixed chamber with 17 ribbed rollers for high density bales. New simple and intuitive control with the Focus 3 terminal. 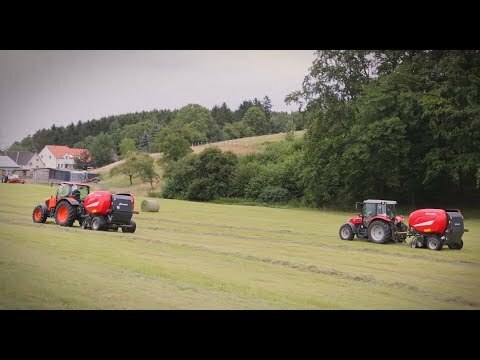 The Kverneland 6350 is a specialist wet silage baler and the ideal solution for producing well-shaped and dense bales. The 17 heavy duty rollers with inner reinforcing discs are designed to work with the heaviest bales. The sturdy drive train of the compression rollers is conceived to withstand the most severe loads. Rollers are mounted on heavy-duty bearings. The small diameter rollers provide maximum density keeping horsepower requirement to a minimum. The bale pressure can be selected from the cab. The ribbed profile of the rollers and the use of 17 rollers ensure reliable bale rotation whatever the crop conditions.